Many commentators, wiser than me, have much to say about how to avoid a repeat of the tragedy along the Mid-Atlantic coast as superstorm Sandy swept massive amounts of water over places previously held to be safe from water. But away from the immediate coastline, the problems brought on by Sandy - more than eight million homes left without power or heat - have less to do with water than with wind. Photos of the inland havoc wreaked by the superstorm tend to show, not huge amounts of water where it normally doesn't go, but rather trees of all sizes listing at unnatural angles. Immense numbers of trees were felled in Sandy's path, many taking down houses and other structures, some even taking human lives. But the reason that so many homes were affected was that so many power lines went down with the trees. Of course, all the homes downstream from a severed power line instantly lose power. But more than that, when a live wire touches the ground the resulting massive current drain can take out the relay station feeding the line, plunging the whole neighbourhood into the cold and dark, not just the street where the tree came down. Peco Energy Co. reports that most of the outages it is repairing occurred outside of Philadelphia, in leafy Bucks and Mongomery counties. In center city Philadelphia there was barely a flicker: that is where power lines tend to run underground (and where there are far fewer trees to fall on them anyway). In preparation for "the next big one" it has been suggested that every home should have its own backup power, mostly in the form of a portable power generator. But that's like suggesting that each home is responsible for paving the street in front of it. Portable power generators run on gasoline: they are loud, smelly, and dangerous: beside the possibility of carbon monoxide poisoning, the outlets on most of these generators have no protection whatsoever from the elements. It's easy to imagine one getting short-circuited by driving rain whipped on by hurricane-force winds. On top of that, portable generators are woefully inefficient: most of them are good to power a fridge and a few light bulbs, but not strong enough to support a house heating system. And they compete with cars for the gasoline that is in such limited supply in the region right now. If you have natural gas coming into your house for heating or cooking, you can buy power generators that run on natural gas. But including installation those systems run close to $10,000. Ouch. 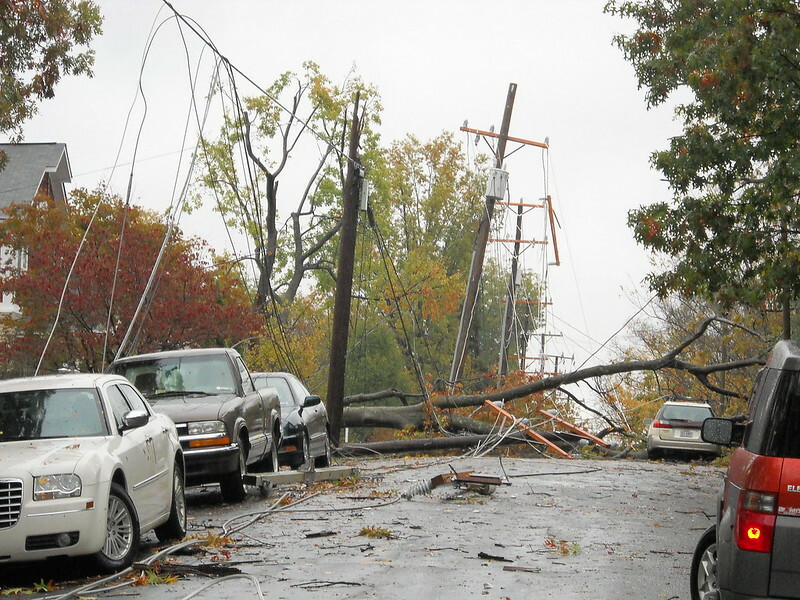 Over the long term, the cheapest solution for keeping power up for everybody, at least in a reasonably densely populated area such as a city or town, is to put the power lines underground where they are safe from falling trees. This is already common practice for new developments. The number usually bandied about for burying existing power lines is $1,000,000 per mile of power line (so if there are more then 100 homes on a mile of road this is cheaper than installing natural-gas generators for each home). I'm not sure why burying power lines is so expensive: perhaps because you basically end up re-surfacing the road. You could save a bundle if you installed underground power lines as you are repairing roads, one road at a time as your local budget allows. Better yet, you could install power lines to run underneath bicycle paths that you surface with pavers not asphalt. That way you can make the infrequent repairs quickly and cheaply, and with a minimum of disruption, since bicycle traffic is much easier to divert than car traffic. In the aftermath of future storms (for with the onset of climate change you can be sure there will be more like Sandy, all up and down the coast) bicycles are the transportation mode of choice, as you can lift them over any trees that have fallen over your path - try to do that with a car! - and since they are muscle-powered they won't be vulnerable to fuel shortages. If you must drive a car, at least arrange to drive one that has a 21st-century fuel efficiency. With a car that does better than 35 mpg you could stay calm even if the fuel supply to your region was cut off temporarily. If we all drove cars like that, the lines at gas stations would be a lot shorter than those you see now throughout the Mid-Atlantic region. And, of course, in a gas sipper car every mile you drive would cause less of the carbon dioxide emissions that brings on the climate change that results in extreme weather. The future is in our hands. Well-thought-out article, thanks, and I particularly like the concept of laying underground cable underneath bicycle lanes! I agree that personal generators are horrible. So is being without power though. I'm a firm believer in more independence from central utilities. Where I live solar power is a great option from a climatic point of view, though still revoltingly expensive. Germany's doing really well with solar, a great success story. Appliances like induction cookers also help to reduce the load, along with a green lifestyle. You're right, the future is indeed in our hands, and Sandy has got a lot more people thinking about it now. Those times that we lose electricity is when we realise just how much we depend on it: so it only makes sense to protect the infrastructure. Volkswagen Polo, 53 MPG: Look ma, no batteries!